Throughout its history, Chevrolet has offered stylish, affordable and dependable family cars with a little something extra. In the case of the 2013 Malibu, that something extra is an all-new 2.0L turbocharged engine designed to infuse the new Malibu midsize sedan with real Chevrolet spirit. “The all-new turbocharged engine showcases just how capable the new Malibu is, and the turbocharged Malibu is perfect for customers who want a midsize sedan that is fun to drive under a wide range of real-world conditions,” said Mark Meyers, GM global vehicle performance manager. 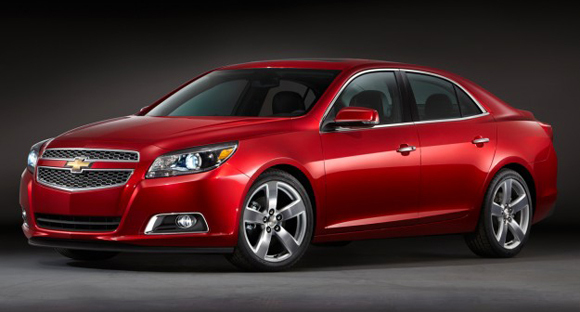 The Malibu turbo can sprint from 0 to 60 mph in 6.3 seconds and achieve a top speed of 155 mph. Even with this performance delivered by its 259-horsepower (193 kW) engine, the Malibu turbo has an EPA-estimated fuel economy of 21 city and 30 mpg highway. With its peak torque of 260 lb.-ft. (353 Nm) sustained between 1,700 and 5,500 rpm, the turbocharged engine also gives Malibu excellent response under a broad range of driving conditions. This added performance comes with greater refinement as the enhanced torque reduces downshifts and helps quiet the buzz sometimes found in four-cylinder engines. Malibu turbo includes a four-wheel-independent suspension system, hydraulic ride bushings, premium electric steering gear and more. “With its global pedigree and European tuning, the new Malibu has a robust body structure, premium steering and suspension, and substantial four-wheel disc brakes,” said Meyers. The Malibu turbo goes on sale this fall, available as both a mid-level LT model with a suggested retail price of $27,710 and as a more luxurious LTZ model with a suggested retail price of $30,925. Both prices include a $995 dealer freight charge. • Chevy MyLink, with a seven-inch color touch-screen radio, Bluetooth, and USB port. • Dual-zone automatic climate control. • Eight-way power driver seat with power lumbar. • Tilting and telescoping steering column with steering wheel controls for audio and cruise control. • Available 19-inch aluminum wheels. • Twin-scroll turbocharger that virtually eliminates turbo lag and generates maximum boost of 20 psi. • Air-to-air intercooler that reduces the pressurized air charge’s temperature for optimal performance. • A356T6 aluminum cylinder head cast with Rotocast process – similar to the Corvette ZR1’s heads – for greater strength and improved airflow. • Sand-cast aluminum engine block that features cast-in iron liners and structural enhancements to enable higher power with reduced noise and vibration. • Aluminum pistons with jet-spray cooling, which enhances performance and longevity. • Modular balance shaft system in the oil pan for greater refinement. • Two–stage variable-displacement oil pump that enhances the overall operating efficiency of the engine. • Specially tuned exhaust for reduced backpressure and improved sound quality. The advanced, electronically controlled turbocharger’s twin-scroll design optimizes power. Each of two scrolls on the turbine is fed by a separate exhaust passage – one from cylinders one and four, the other from cylinders two and three – to virtually eliminate turbo lag at low engine speeds, giving the engine immediate throttle response. Because direct injection cools the intake process, compared to conventional port injection, the engine can operate at higher boost and a relatively higher compression ratio of 9.2:1, which increases both output and efficiency. Also, each piston has its own directed jet that sprays oil toward its skirt, coating its underside and the cylinder wall with an additional layer of lubricant. That cools the piston, reduces friction and operational noise and bolsters the engine’s durability. The 2.0L turbo engine is matched with the Hydra-Matic 6T70 six-speed automatic transmission, with TAPShift control. Sold in more than 100 countries, the new Malibu benefits from a global development process that prepared the car for everything from unimproved roads in developing countries to the Autobahns and mountain switchbacks of Europe. “You feel connected to the road in the Malibu turbo, while also being isolated from wind noise and imperfections in the pavement,” said Meyers. “Behind the wheel, the new Malibu turbo feels responsive. The steering is precise on center, with a confident steering effort build-up as the driver turns into a curve. The chassis feels great in the corners, with excellent body-motion control. “The Malibu is a fun car to drive, and the power of the turbo engine makes it even better,” said Meyers. • MacPherson-strut front suspension with dual-path mountings, which separates the transfer of spring damper loads to the body to a smoother-feeling ride and an enhanced feeling of control. New for the turbo model are internal rebound springs for the front struts that give the Malibu improved body motion control and roll damping in handling maneuvers. • Side-load-compensated strut modules are designed to reduce the sliding friction caused by the bending load on the strut that is common in most suspension geometries, for more precise suspension tuning. • Aluminum steering knuckle/strut carriers and control arms are used to minimize un-sprung weight, optimize weight distribution throughout the front suspension and intended to foster a more nimble driving feel. • Rack-mounted electric power steering gear by ZF Steering Systems. This dual-pinion system – one for steering and the other to move the rack – is designed to deliver excellent response and on-center characteristics, with almost perfect linear response. It also helps save fuel because engine doesn’t have to turn a conventional hydraulic steering pump. The 2013 Malibu Turbo also offers 10 standard air bags, as well as an available rearview camera system, Forward Collision Alert and Lane Departure Warning. It is also the first 2013 midsize car to earn double honors for safety, including a 5-Star Overall Vehicle Score from the National Highway Traffic Safety Administration and a 2012 Top Safety Pick by the Insurance Institute of Highway Safety.